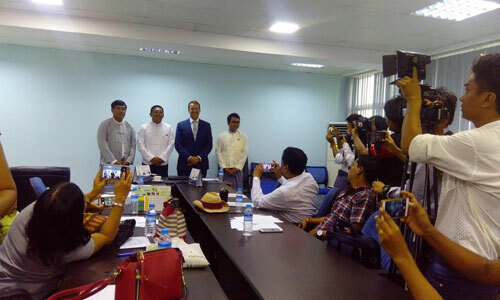 Mr. U Htin Aung Khine (second left), President, Myanmar Computer Industry Association and Mr. Fraser Hawkes (second right), General Manager, UBM Myanmar presided over the press conference announcing CommuniCast Myanmar 2017 and International Myanmar ICT Exhibition 2017. CommuniCast Myanmar 2017 is the fourth edition of the annual communications technology, enterprise and convergence solutions show. Joining forces with the Myanmar Computer Federation’s International Myanmar ICT Exhibition and the Myanmar Satellite Forum, the event covers the full spectrum of the ICT industry, from satellite and broadband through to mobile and enterprise solutions, under one roof.These events will be held on 28 — 30 November 2017 at MEP @ Mindama, Yangon.